The Board of Directors for the Hamlin Memorial Library requested a design for a mural in the large meeting room and were open to ideas that I could offer them. Playing off of the mural being located in a library, I proposed a giant, opened atlas which would serve as a historic record of McKean County, acknowledging local landmarks and serving as an educational tool as well as offering a tourist spot for Smethport. In addition to painted elements, the completed mural also incorporates five digital photo frames with scrolling images of McKean County offering viewers a glimpse of local landscapes, industry and people. 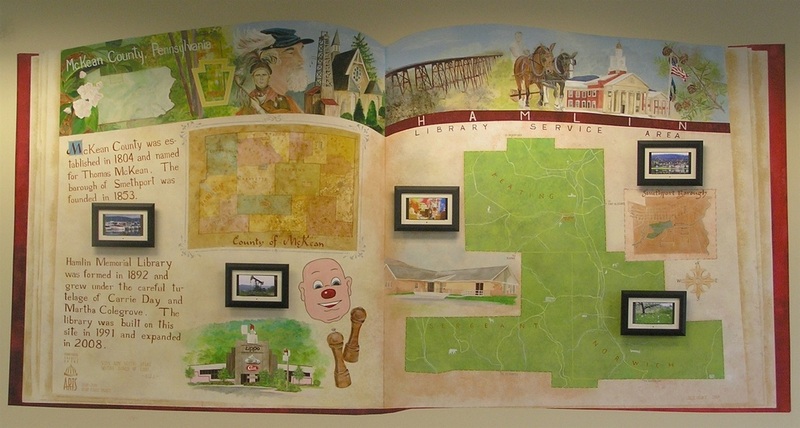 The "Service Area" mural at the Hamlin Memorial Library was made possible by a PPA grant from the PA Council on the Arts. 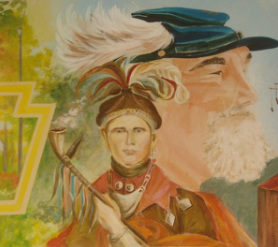 You are invited and encouraged to visit Smethport, PA and see the mural in person at Hamlin Memorial Library.